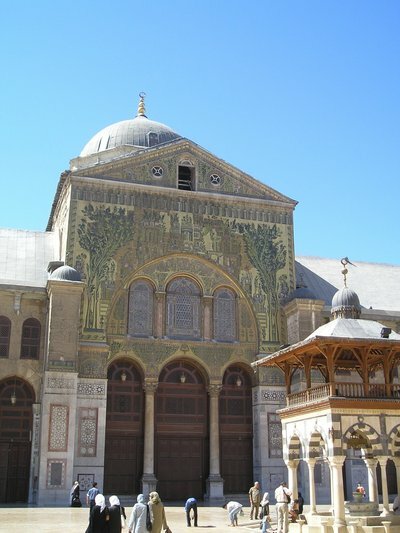 The 7th C. CE Umayyad Mosque, Damascus, showing mosaics in the south side of the courtyard. Photograph 2005 via Wikimedia Commons. Thus, at a time when the Assad regime has slain at least 11,000 of its subjects, according to Syrian opposition sources, and U.S. and other foreign governments attempt to find a means to stop the bloodletting, the Hartford Seminary happily maintains a "partnership" with a religious institution under the dictator's wing. Dr. Hussam al-Din Farfour [alternative spelling: Hassam-Eddin Farfour], founder of Al-Fat[i]h University in Damascus, and Dr. Maher abu al-Dahab, dean of languages at the university. They said their university would work to send five students a year to Hartford Seminary. The Seminary group also met with the leaders of two state universities, in Damascus and Aleppo. ... Ibrahim Abu-Rabi' ... said these two universities are considering sending students to the Seminary. Yet Hartford's relationship with Assad is deeper still. In 1991, the seminary considered itself to have scored a "first" in appointing a Muslim to its core faculty. The individual so honored was the late Ibrahim Abu-Rabi (1956-2011), a Palestinian who moved to the University of Alberta, in Edmonton, Canada, in 2009. [T]he author devotes half his book to the analysis of what he calls the "grandiose exegesis" of Sayyid Qutb, the vituperative Egyptian thinker who helped establish so many of modern fundamentalism's main features, including its hatred of moderate Muslims and its anti-Semitism. To say that Abu-Rabi is sympathetic to Qutb (and several other fundamentalist authors) would be an understatement. In fact, he serves as their apostle to an English-speaking audience. Abu-Rabi additionally flaunted his association with Ramadan Shallah, once a colleague at the University of South Florida of Sami Al-Arian who in 2006 pled guilty to conspiracy to assist the Palestinian Islamic Jihad (PIJ) terror group. Shallah had joined Al-Arian in operating the World and Islam Studies Enterprise (WISE), a think-tank, only to surface in Damascus in 1995 as head of PIJ. In 2006 he was added to the FBI's roster of most wanted terrorists. In a 2010 alumni bulletin, the University of Alberta described breathlessly a trip organized by Abu-Rabi to Syria, with the cooperation of his "friends -- Abdul-Fattah Al-Bizen, the Mufti (foremost [Sunni] Islamic religious authority) of Damascus, and Sheikh Hassam-Eddin Farfour, personal religious adviser to Syrian president Bashar al-Assad." Al-Bizen, a director of Al-Fatih Islamic Institute, is a puppet of the Assad regime. In January 2012, as the dictatorship was slaughtering its subjects en masse, Sheikh Farfour spoke fulsomely of Assad, praising the tyrant's "concepts of tolerance and forgiveness ... [which] constitute a part of the reform process and of the decrees which serve the interests of the homeland." He then called on the Syrian people to "cooperate and unite their ranks to restore the security and stability to their homeland." According to a Wikileaks cable originated by the U.S. State Department in 2008, Assad had attempted to deport new and first-year foreign students attending Al-Fatiha and two more privately-funded Islamic academies in Damascus. But the dictator was, according to the cable, persuaded to rescind the order by the argument that the students would serve as "ambassadors for Syria." In other words, it was in Assad's interest to continue using the schools to produce propagandists and sympathizers of his regime. Hartford's blind flirtation with radical Islam is not limited to providing faculty space for Abu-Rabi. Hartford's faculty also includes Ingrid Mattson, the headscarf-sporting former president of the fundamentalist Islamic Society of North America (ISNA). ISNA has been exposed as an arm of the Muslim Brotherhood, acting in cooperation with Saudi Wahhabis and South Asian jihadists. Mattson, who appeared as a Muslim participant in the 2009 inauguration of President Barack Obama, possesses a long and dismaying biography as an apologist for Islamist extremism. In the aftermath of the terrorist attacks of 9/11, Mattson was among the most prominent in purveying the claim that jihad in Islam could be only defensive, and in portraying Wahhabism -- which inspires al-Qaeda -- as a reform movement comparable to Protestant Christianity. Since then she has promoted a totalistic view of sharia law as applicable to all human transactions -- in line with Islamist ideology. The Hartford Seminary also evinces great pride in its Islamic chaplaincy program, which produces Muslim clerics for service in "prison ministry, hospital, university, military, or community work." Given the predominance of Saudi-inspired Wahhabi imams among Muslim prison clerics in many American correctional institutions, Hartford's Muslim chaplaincy program deserves a long-delayed examination. As atrocities by the Syrian regime increase, the terrorist group Hamas has decamped from Damascus, although Palestinian Islamic Jihad reportedly remains in place there. PIJ has no problems with the horrors perpetrated by Assad and his cohort, and neither, it seems, has the Hartford Seminary. Hartford's Congregationalist founders, were they alive today, might very well say the time has come for a thorough review of the Seminary's Middle East misadventures, as part of an old-fashioned New England housecleaning.